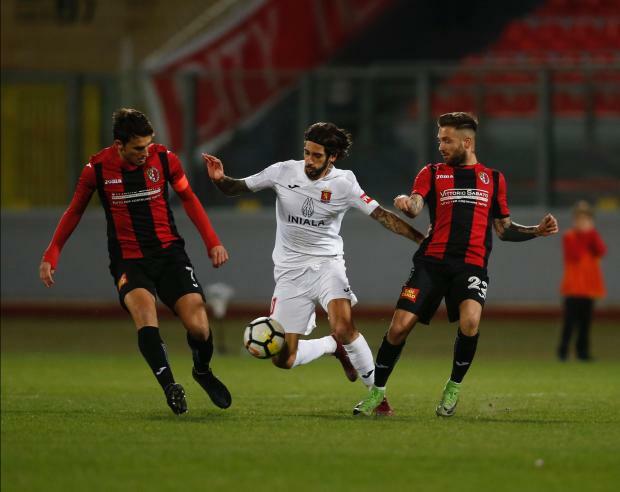 Ħamrun Spartans stunned champions Valletta as a Kevin Tulimieri second-half goal earned them a 1-0 win at the National Stadium. The Spartans started brightly and they created the first chance on 18 minutes as William Domoraud powered through but was denied by the onrushing Henry Bonello. At the other end, Manuel Bartolo came to the Spartans rescue when he somehow kept the ball out after Kaljevic’s close-range effort. Domoraud continued to create problems to the City defence with his physical presence and on 34 minutes saw his drive pushed away by Bonello. Five minutes from the break the City keeper produced a fine save to keep out Kevin Tulimieri’s diving header following Ryan Darmanin’s cross. On the restart, Doncic was forced to replace the excellent Bonello, who picked up an injury, with Yenz Cini. Valletta started strongly and a Saleh shot finished just over on 47 minutes. But the Spartans slowly started to regroup and continued to share the exchanges with their more-quoted opponents. Chances remained few and far between but the game came to life on 69 minutes. Ħamrun were awarded a central free-kick from which Criaco’s shot was deflected into the path of Tulimieri who let fly a scorching shot that flew past a static Cini. Valletta tried to fight back and on 77 minutes Mario Fontanella picked up a short rebound but fired over. Nine minutes from time, Kaljevic almost levelled matters when his header had the better of Bartolo but Triston Caruana was on hand to clear off the line. Ħamrun finished the match with ten men when Karl Micallef picked up his second yellow card. Ħamrun midfielder Kevin Tulimieri was voted as the BOV Player of Match.